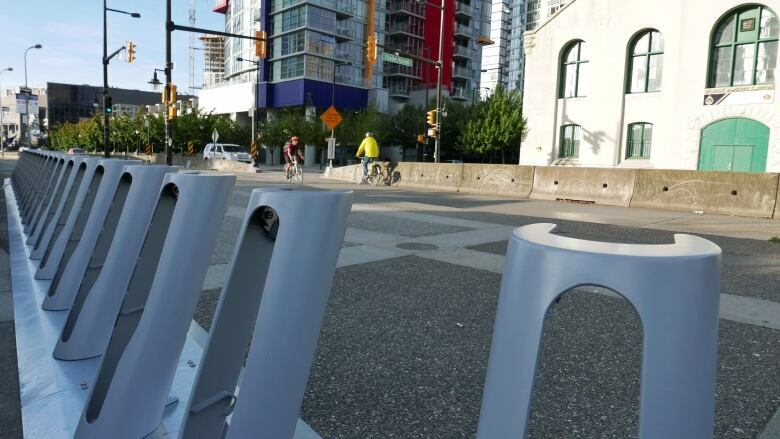 Vancouver bike share set to roll — at last! The City of Vancouver's long-awaited bike share program finally appears set to roll — at last. The bicycle rental network — which will eventually include up to 1,500 bikes — is set to launch over the next couple of weeks, said Jerry Dobrovolny, the city's general manager of engineering. The City of Vancouver's long-awaited bike share program is finally ready to roll. Vancouver's bike share program was first announced nearly seven years ago but has been plagued by setbacks. The service areas will include downtown Vancouver, and will be bordered by Arbutus Street, West 16th Avenue and Main Street. A second phase could broaden the zone from Macdonald Street in the west to Commercial Drive in the east. Dobrovolny said bike share program will make it even easier for Vancouver commuters to bike to work, noting that cycling trips increased 32 per cent last year, with more than 130,000 trips per day. "We're leading North America in journey to work trips," Dobrovolny said. "So what it means is that already, for a city that already makes is easy to get around without owning a car, it makes it even easier." Bike share programs have "exploded" in popularity in major cities across the globe in the last decade, he noted. The bike rentals are aimed at both commuters and tourists. Dobrovolny said stations will be located at cycling-friendly spots near established bike routes such as Hornby Street, the seawall and False Creek as well as near SkyTrain stations and bus stops. The bike share program will operate much like a car share, with annual memberships and ride costs tabulated based on time. An early bird membership plan, which ends July 31, is available for $99 for a year, with unlimited free rides that take less than half an hour. CycleHop will provide helmets for those who don't have their own. They will also supply a beanie cap for hygiene. City council approved the bike share program in July 2013. It was initially expected to launch by early 2014, but issues with its bicycle supplier, Bixi, and the company that was contracted to run the program, Alta Bike Share, delayed the program. In early 2014, it was announced the company that owns Bixi owed $50 million to various creditors, including the City of Montreal and that it was headed for bankruptcy. Last year, the city announced it would seek a new company to install and operate the program.